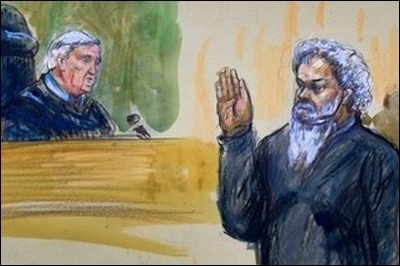 An artist's rendering of Abu Khattala at his June 28 hearing at the federal U.S. District Court in Washington, D.C. The Obama administration has brought an accused Libyan terrorist named Ahmed Abu Khattala to Washington for trial. His saga reveals how the government views the Islamist threat, and it's discouraging. Fortunately, a much better alternative exists. Abu Khattala stands accused of taking part in the murder of an ambassador and three other Americans in Benghazi in September 2012. After an achingly slow investigation, during which time the suspect lived in the open and defiantly gave media interviews, the American military seized him on June 15. After being transported by sea and air to Washington, D.C., Abu Khattala was jailed, provided with a defense attorney, Michelle Peterson, indicted, arraigned, and, after listening to an Arabic translation of the proceedings, pleaded not guilty to a single charge of conspiracy and requested a halal diet. He potentially faces life in prison. This scenario presents two problems. First, Abu Khattala enjoys the full panoply of protections offered by the U.S. legal system (he actually was read his Miranda rights, meaning his right to stay silent and to consult with a lawyer), making conviction uncertain. As the New York Times explains, proving the charges against him will be "particularly challenging" because of the circumstances of the attacks, which took place in the midst of a civil war and in a country brimming with hostility to the United States, where concerns about security meant that U.S. law investigators had to wait for weeks to go to the crime scenes to collect evidence, and the prosecution depends on testimony from Libyan witnesses brought over to the United States who may well falter under cross-examination. Secondly, what good does a conviction bring? If all goes well, a minor operative will be taken out of commission, leaving the ideological sources, the funding apparatus, the command and control structure, and the terrorist network untouched. A years-long, cumbersome, expensive, and draining effort will prove a point, not damage the enemy. If Abu Khattala is convicted, administration officials can crow but Americans will be only marginally safer. This futility recalls the 1990s, when terrorist attacks were routinely treated as criminal incidents and handled in courts of law, rather than as warfare to be dealt with using military force. In response, I complained in 1998 that the U.S. government saw terrorist violence "not as the ideological war it is, but as a sequence of discrete criminal incidents," a mistaken approach that turns the U.S. military "into a sort of global police force and requires it to have an unrealistically high level of certainty before it can go into action," requiring it to collect evidence of the sort that can stand up in a U.S. court of justice. George W. Bush discarded the criminal paradigm when he dramatically declared a "war against terrorism" in the evening of 9/11. While that is a clumsy phrase (how can one make war on a tactic? ), what became known as the Bush Doctrine had the great benefit of declaring war – as opposed to a police action – on those attacking Americans. But now, 13 years later and in part because of the success of this war, the Obama administration has reverted to the pre-9/11 approach of apprehending criminals. Instead of this, the U.S. response to terrorist attacks on Americans citizens should be immediate and lethal. As I wrote 16 years ago, "anyone who harms Americans should know that retribution will be certain and nasty. … When reasonable evidence points to Middle Eastern terrorists having harmed Americans, U.S. military force should be deployed. If the perpetrator is not precisely known, then punish those who are known to harbor terrorists. Go after governments and organizations that support terrorism, not just individuals." Skip the fine-grain analysis of who carried out the attack. Security depends not on complex court procedures, but on a record of U.S. deterrence established by "years of terrible retribution against anyone who so much as harms a single American citizen." Enemies must expect to face the full fury of the United States when they harm its citizens, thereby dissuading them from committing such attacks in future. American taxpayers turn over $3 trillion a year to the federal government and in return expect to be protected from foreign threats. This holds doubly for citizens who venture abroad on behalf of their country, such as the four embassy personnel killed in Benghazi. Crimes require rules of evidence, Miranda rights, lawyers, judges and juries. Warfare requires full-throated retaliation by the American military.